A big thank you to nelsonspirit Future Leaders Fund supporter, David Goldson, for his recent donation to the fund and for his on going support. David, who has just finished as Chairman of South Norfolk Council, former Navy officer and Nelson fan, chose the Future Leaders Fund as one of the charities he would support. 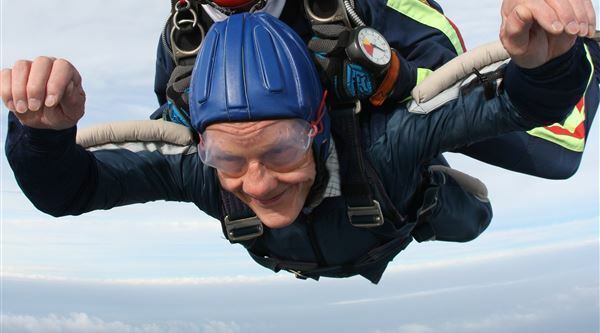 Back in October he completed a charity sky dive (pictured) and supported the Future Leaders Fund with the money he raised. We are very grateful of David's support for the nelsonspirit Future Leaders Fund which provides modest grants to Norfolk based young people aged between 17-24. With the help of David and other business leaders we have supported seven young people engaged in community projects as leaders around the globe and locally too. For more information on the Future Leaders Fund please click here.